The World Health Organization (WHO) has declared March 24, 2016 as World Tuberculosis (TB) Day . Over the month of March, the Global Health Office will be publishing a series of blog posts about TB in hopes of raising awareness of its worldwide impact. WHO’s “End TB Strategy” has a goal of ending the TB epidemic by 2030, by targeting poverty, improving testing and treatment, ending stigma and discrimination, and driving research and innovation. Put simply, TB is not yet a disease of the past, but if we unite and focus our efforts, we can make TB history. Mycobacterium tuberculosis scanning electron micrograph. Mag 15549X. Source: CDC. Now that you have an idea of how TB is spread, its symptoms and its worldwide burden, let’s talk about how TB is diagnosed. When a patient presents with the symptoms discussed in the last blog post (coughing up blood, cough lasting longer than 3 weeks, unexplained weight loss, etc. ), a medical history is taken to determine whether TB infection is probable. Questions that are asked include whether they have been in close contact with someone with TB, if they have a previous history of TB infection, and whether they have an immunocompromising condition (such as HIV) that could increase the risk of latent TB infection progressing to TB disease . There are two primary types of tests that are used to determine if a patient has been infected with TB bacteria: the tuberculin skin test and TB blood tests. The tuberculin skin test (also called the Mantoux tuberculin skin test) involves injecting a small amount of fluid (tuberculin) into the skin of the lower arm. After 48-72 hours have passed, a trained health care worker will look for a raised, hard area or swelling, to determine whether infection is present. TB blood tests (interferon-gamma release assays or IGRAs) measure how a person’s immune system reacts to TB bacteria by testing a blood sample in the laboratory. Blood tests are preferred for those who have had a TB disease vaccine, or who would have difficulty returning for a second appointment. Testing positive on either of these tests does not differentiate between latent TB infection and TB disease, it simply means the person’s body is infected with TB bacteria . Diagnosing active TB involves a series of other tests. Chest X-rays can be used to check for lung abnormalities, but X-rays alone cannot provide a definitive TB disease diagnosis. Sputum Smear Microscopy (SSM) is one of the techniques used to diagnose active TB. Sputum is examined under a microscope for Mycobacterium tuberculosis. SSM can provide results in 24 hours, but it cannot always distinguish between TB and other infections. Polymerase Chain Reaction (PCR) testing can be used to detect genetic material specific to TB in bacteria; however, this test is complicated and can be much more expensive than SSM. Diagnosing TB outside of the lungs can include tests such as a biopsy, lumbar puncture, urine culture or CT scan . 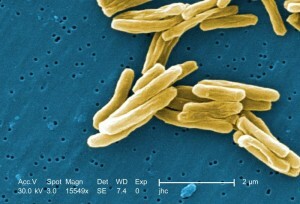 Culture techniques, where TB bacteria can be grown in a laboratory from a variety of specimens, are also used to diagnose active TB, though it can take 1-6 weeks to obtain results. Culture techniques are particularly useful in determining an antibiotic treatment course, an important step in combatting TB. One of the largest issues in TB treatment is properly identifying and targeting drug resistance in order to provide appropriate treatment, a topic that will be discussed in our next post .